Formula racing is any of several forms of open-wheeled single-seater motorsport road racing. The origin of the term lies in the nomenclature that was adopted by the FIA for all of its post-World War II single-seater regulations, or formulae. The best known of these formulae are Formula One, Formula Two, Formula Three and Formula Four. Common usage of "formula racing" encompasses other single-seater series, including the GP2 Series, which replaced Formula 3000 (which had itself been the effective replacement for Formula Two). Categories such as Formula Three and FIA Formula 2 Championship are described as feeder formulae, which refers to their position below Formula One on the career ladder of single-seater motor racing. There are two primary forms of racing formula: the open formula that allows a choice of chassis or engines and the control or "spec" formula that relies on a single supplier for chassis and engines. Formula Three is an example of an open formula, while Formula BMW is a control formula. There are also some exceptions on these two forms like Formula Ford where there is an open chassis formula but a restricted single brand engine formula. In the process of reviving Grand Prix racing after the end of World War II, the Fédération Internationale de l'Automobile's Commission Sportive Internationale was responsible for defining the standardised regulations of Formula One (F1) in 1946. The first race to be run to the early Formula One regulations was a non-championship Grand Prix in Turin in September 1946. The first officially recognised Formula One season was held in 1947 and the World Championship for Drivers was inaugurated in 1950. This was the first example of formula racing. Formula E is the highest class of competition for single-seat, electrically powered racing cars, which held its inaugural season in 2014–15. Conceived in 2012, the championship was intended by the FIA to serve as an R&D platform for the electric vehicle and promote interest in EVs and sustainability. The series races predominately on temporary circuits in cities such as New York, Hong Kong, Zürich, Berlin, Rome, and Paris in events known as "ePrix". In order to cap costs but maintain technological development, the series uses a spec chassis and battery that must be used by all entrants, with competing teams permitted to design and build their own motors, inverter and rear suspension. The series has gained significant traction in recent years. The FIA Formula 2 Championship was introduced in 2017 by Bernie Ecclestone and Flavio Briatore following the rebranding of the long-term F1 feeder series – GP2 Series. Designed to make racing affordable and to make it the perfect training ground for life in F1, F2 has made it mandatory for all of the teams to use the same chassis, engine and tyre supplier. In 2003, the most senior Formula Renault was the Formula Renault V6 Eurocup, which supported the ETCC and FIA GT's "Super Racing Weekends". After just two seasons Renault merged the series with the World Series by Nissan to form the World Series by Renault (WSR), which supported the Formula One Grand Prix. This series includes Formula Renault 3.5, Formula Renault 2.0, and Formula Renault 1.6. The GP3 Series was launched by Bruno Michel in 2010 as a feeder series for GP2. So far, nine drivers have competed in Formula One after GP3 – 2010 champion Esteban Gutiérrez, 2011 champion Valtteri Bottas, 2013 champion Daniil Kvyat, Jean-Éric Vergne, Roberto Merhi, Esteban Ocon, Alexander Rossi, Carlos Sainz Jr. and Rio Haryanto. The GP3 Series will be rebranded as FIA Formula 3 Championship in 2019. Formula Three has a long history, with at least ten active championships around the world. It was created by the FIA in 1950 as the low cost entry point to single-seater formula racing. In 1959, it was replaced by a technically similar formula called Formula Junior, before Formula Three was reintroduced in 1964. Like the other FIA-derived formulae, F3 is an open class that permits a choice of chassis and engines. Notable championships include the FIA European Formula Three Championship, the British Formula Three Championship, and the All-Japan Formula Three Championship. FIA Formula 4, also called FIA F4, is an open-wheel racing car category intended for junior drivers. There is no global championship, but rather individual nations or regions can host their own championships in compliance with a universal set of rules and specifications. The category was created by the Fédération Internationale de l'Automobile (FIA)—the International sanctioning and administrative body for motorsport—as an entry-level category for young drivers, bridging the gap between karting and Formula 3. The series is a part of the FIA Global Pathway. Robert Wickens car before the 2018 Firestone Grand Prix of St. Petersburg. Ana Beatriz during the 2008 Freedom 100 Indy Lights race at Indianapolis Motor Speedway. The NTT IndyCar Series is the premier level of American open wheel racing. The series, founded by Indianapolis Motor Speedway owner Tony George, began in 1996 as the "Indy Racing League" (IRL). In 2008, the series merged with the rival Champ Car World Series, formerly known as CART, to form the IndyCar Series. The IndyCar Series is not an open formula. The league specifies the chassis, engine and tyre manufacturers, which are changed every three years. Currently, all teams run on Dallara chassis and Firestone tires and they can choose between a Honda and a Chevrolet engine. A typical IndyCar season usually contains a mixture of natural-terrain road courses, temporary street circuits, and short & high-speed ovals; including the historic Indianapolis 500. The current Indy Lights presented by Cooper Tires is the feeder series for the IndyCar Series, similar to F1's relationship with Formula 2. The original Indy Lights (known as "American Racing Series") acted as a developmental circuit for CART from 1986 to 2001. In 2001, the Toyota Atlantic series was equally effective in providing new drivers, so CART cancelled the Indy Lights. The current series was founded in 2002 by the Indy Racing League. It initially struggled to attract drivers and some races had fewer than ten entrants. However, with the introduction of road courses in 2005 and a boost in prize money in 2006, drivers like Marco Andretti and Phil Giebler were attracted to compete in the Indy Lights championships part-time, expanding the field to twenty or more cars in every race in 2007. As the spec car (a Dallara with a Nissan VRH35 engine) had been used since INDYCAR established the series in 2002, the number of drivers has decreased again with just nine drivers competing the entire season and so far eight other drivers running three or less races. A new Dallara IL-15 with an Advanced Engine Research 2-litre turbocharged 4-cylinder engine will be the specification starting in 2015. The Indy Pro 2000 Championship presented by Cooper Tires has been a racing driver development series since 2011, when it became governed by Indy Racing League, although the original series started in 1991 as the Star Mazda Championship. Drivers currently use Formula Mazda cars built by Star Race Cars with a 250 hp Mazda 'Renesis' rotary engine and Cooper tyres. Cooper Tires presents the U.S. F2000 National Championship powered by Mazda is an American variation of the Formula Ford. The series was initially founded by Dan Andersen and Mike Foschi in 1990 and regularly fielded over 60 entries per race. In 2001, the series was sold to Jon Baytos who introduced a number of controversial rule changes that brought the series out of alignment with similar SCCA classes, which led to a reduction in participation and the end of the series in 2006. In 2010, the series returned under the leadership of Andersen with the intent to return F2000 to its status as a feeder formula for higher open wheel racing classes in the United States. The Super Formula, a.k.a. Formula Nippon, is the premier level of Japanese formula racing. It began as the Japanese Formula 2000 series in 1973 and continued to use Formula Two regulations after European Formula Two had ended in 1984. In 1987 the series switched to the Formula 3000 standard, so that Japanese and European regulations paralleled one another again. However, in 1996, the International Formula 3000 series became a one-make format to reduce costs and the Japanese Formula broke away, changing the series' name to Formula Nippon. Until recently, Formula Nippon was an open formula – chassis were supplied by Lola, Reynard and G-Force, while Mugen-Honda supplied most engines. However, in 2001/02 G-Force and Reynard withdrew and the series once again followed F3000's lead in becoming a one-make series. In 2006, the regulations were changed drastically – the chassis was replaced and the engines provided by Toyota and Honda had the same specifications as the engines used in the 2005 IndyCar Series. The Formula Challenge Japan (FCJ) is promoted as a young driver development project jointly by Honda, Toyota and Nissan. It replaced the Formula Dream. The first season was in 2006 and carried on from the defunct Formula Dream series. Each participant needs to be younger than 26 years old and possess a National A racing license, but not having raced in Formula Three or above. The cars run on a Tatuus chassis, Dunlop and a 200 hp 2.0L engine, similar to that of a Formula Renault 2.0 car. 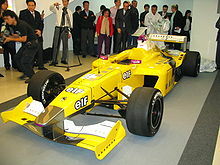 As of 2009, the series supports the Formula Nippon. In 2015, the series will be replaced with Japan Formula 4. Formula series from the 21st century that could be categorised between Tier 1 and Tier 5 (see top of page), but are now defunct, are described below. The Formula Two regulations were first defined in 1947 as a form of B-class below Formula One. It was not unusual for some Formula One events to include a number of F2 entries in the same field and the entries in the World Championship seasons of 1952–53 comprised exclusively F2 cars for reasons of cost. F2 had a patchy history until the inauguration of the European Formula Two Championship in 1967. F2 was an open formula that allowed the use of any chassis that met the prescribed regulations; it was well supported during the 1970s, with chassis from Tecno, March Engineering, Toleman, Ralt, Matra and others. The European championship ran continually until the creation of its successor, Formula 3000, in 1985. In 2008 it was announced by the FIA that Formula Two would return in 2009 in the form of the FIA Formula Two Championship. This series was discontinued after the 2012 season. The Formula 3000 was created by the Fédération Internationale de l'Automobile in 1985 to become the final step for drivers before entering Formula One. Formula Two had become too expensive and was dominated by works-run cars with factory engines. Formula 3000 offered quicker, cheaper, more open racing. The series began as an open formula, but in 1986 tyres were standardized, followed by engines and chassis in 1996. The series ran until 2004 and was replaced in 2005 by the GP2 Series. International Formula Master, a.k.a. Formula Super 2000, was conceived as a competitor for Formula Three. It started in 2005 as the 3000 Pro Series, organised by Peroni Promotion. MTC Organisation took over in 2006 and turned it into a support series for the WTCC. Drivers used second-hand Formula 2000 cars made by Tatuus that were powered by a 250 hp Honda K20A engine. A1 Grand Prix (A1GP) was unique in its field in that competitors solely represented their nation as opposed to themselves or a team, the usual format in most formula racing series. As such, it was often promoted as the "World Cup of Motorsport". Also, the series attracted equal numbers of (former or future) Formula One drivers and IndyCar Series drivers. The concept was founded by Sheikh Al Maktoum of Dubai in 2004, but sold to the FIA in 2005. The races were held in the traditional Formula One off-season, the northern hemisphere winter. Between 2005 and 2009 29 countries from five continents participated. Using 750 hp V12 engines, Superleague Formula introduced team sponsorship by association football clubs. In qualifying, the link with football was also present as the series employed a system based on a group stage to knock-out format used in some football tournaments. Another unique feature of Superleague Formula was the Super Final, a five lap shootout between the six best drivers of a weekend. In 2010, the series offered the biggest prize fund in European motorsport with the champion set to earn €1 million. In theory, it would be possible for a driver to earn up to €2.2 million over the course of the season. This was all done to give drivers a chance to earn a living from motorsport. 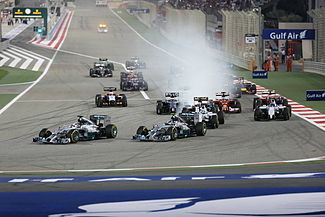 By 2011, the link with football was fading with more than half the teams no longer associated with football teams, The later races of the season did not take place, and no further seasons were organised. Formula Asia V6 (Renault) was launched in 2006 to give Southeast Asian-based drivers a chance to progress from karting through junior single seaters to international motorsport. Karun Chandhok, for example, won the 2006 championship and was rewarded with a test in a World Series by Renault car at Paul Ricard. Drivers ran with Tatuus chassis, a Renault 3.5L V6 engine and Michelin tyres. The Auto GP World Series' roots can be traced back to 1999 and the Italian Formula 3000 series. At first, nearly all races were held in Italy, but the series expanded throughout Europe quickly. In 2001 the series became European Formula 3000 and in 2004 Superfund became the title sponsor, planning to set up the Formula Superfund series. However, the funding was pulled and the series was cancelled. Therefore, Coloni Motorsport re-established the Italian Formula 3000 and expanded this in 2006 to the Euroseries 3000. In 2010, the first-generation A1 Grand Prix cars replaced the Lola F3000 chassis and the Auto GP name was adopted. ^ FIA (2017). "Formula E Season 2017-2018". Retrieved 10 December 2017. ^ "Championship Overview". fiaformulae.com. Retrieved 10 December 2017. ^ British F3 Champions Archived 17 August 2007 at the Wayback Machine From motorsportsetc.com. Retrieved on 28 August 2007. ^ Formula Two Archived 28 March 2012 at WebCite From formula2.net. Retrieved on 28 August 2007.